Purebred Savanna bucks registered with the American Savanna Registry. They boys were all born late March 2018. If you are looking to add Savanna influence into your meat goat herd with a splash of color, these bucks will work! Up to date with all vaccines and wormer. Delivery is available. With the need to downsize and with a sad heart I will be offering one of my bucks for your consideration. I have 4 beautiful daughters from Dezi and really don't have any does to breed him too. Dezi is a buck that is so sweet and gentle and cares for his girls. He is tall, long and very dairy and has no problem passing this on to his offspring along with tons of color. Boer & Savanna Kids Expected March/April 2019! Fullblood, purebred and percentage kids will be available. All of our meat is processed at a local state inspected facility. Our goats and lambs are raised under all-natural conditions never with hormones, or antibiotics to stimulate growth. Grass and alfalfa are the main feed ingredient although a small amount of grain is used to promote growth. 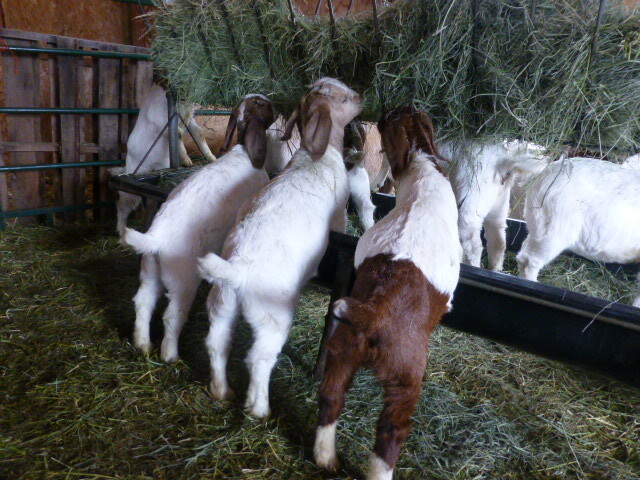 Our animals are generally from 7 to 12-month old, +/- 80 to 90 pound weanlings of Boer, or boer cross breed goats. Goat is known for its lean, yet tender and flavorful characteristics. While more mild in flavor than lamb, goat is not as rich or as greasy as lamb, yet still very juicy. Goat is especially rich in protein and iron, but contains only a modest fat and cholesterol making this meat a logical choice for a high protein, low fat diet. We have a variety of cuts available and offer delivery to the Kalispell area.